I presented a keynote speech at the recent Velo-City 2010 Bicycle Conference here in Copenhagen and it was a departure from my use talk about Four Goals for Promoting & Marketing Urban Cycling. It was all about anthropology relating to urban cycling - the tiny behavioural details that the bicycle brings to society and the streets. I wrapped up for a call for the re-humanising of urban cycling and the need to look not at the nerdy techgeek aspect of the machine but rather at the human beings who ride them. As well as the enormous positive effect that the bicycle gives the societal fabric in our cities. Anyway, the result was that I was out on a photo shoot and found myself shooting people on bicycles - and then promptly cropping out the bicycles so that we're just left with homo sapiens - fellow citizens - gracing the urban landscape with their transportational motion. It's another attempt at photographic reductionism. Bicycle culture minimalism. Many of the bodies and limbs reveal that the person is on a bicycle. Many don't. Let the gearheads get all hot and bothered about the bicycle. Sure, bicycles are a gift to our cities and towns, but I prefer to celebrate the people who ride them. Without them we're just left with awkward piles of steel and rubber. It's not about the bicycle. It's about you... on a bicycle. Some, more obvious than others. The NOT SO OBVIOUS, are the best. I follow your blog on facebook and while I enjoy looking at the images you post, I worry about the complete absence of helmets. I cycle in North West Britain and it would seem to me that riding without one is inviting trouble. I'm also trying to encourage my children to wear them although their peers view them as "uncool" a point of view you seem to be promoting too. It's because I don't trust car drivers that I view them as essential. I have to agree a bit with Anonymous in NW Britain...while I know that getting on a bike is the most important issue, I would love to see cycle chic do a post of chic riders with helmets. Here in North America, I would never think of riding without a helmet. When I'm in Denmark, where there are tons of commuter bikes, I don't feel as unsafe so I always ride without one. Until we get more riders on the road in many parts of the world, it would be good to promote safety...and chic safety would be awesome! I don't think it's this blog's job to be promoting safety (meaning by N. American standards). 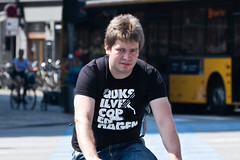 He's showing bicycle culture in Copenhagen. Which doesn't often involve helmets. In fact I think it's a testament to the way that an entrenched, holistic bike culture actually decreases the need for helmets. "I wrapped up for a call for the re-humanising of urban cycling and the need to look not at the nerdy techgeek aspect of the machine but rather at the human beings who ride them. As well as the enormous positive effect that the bicycle gives the societal fabric in our cities." Thank you for bringing up these 'points' there and here at your website. I share the view of Bill Crandall! Remarkable post. It's about PEOPLE. Thank you for this. No, it's about YOU, Mikael. The pictures that were taken from the back seem to be the most impressive to me. What a novel idea for a post. Now if all of us could just see each other as others "like us". Let's look at the most common causes of bicycle accidents. How many of these are really possible in Copenhagen because of the infrastructure? 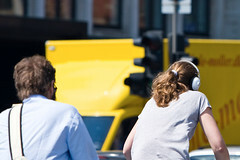 With so many people cycling in Denmark, the mostly separate infrastructure, the higher standards for driver training, and the fact that drivers are much more used to seeing bicycles, the accidents for which one needs a helmet seem really reduced. This idea works for those of us that are familiar with this blog, but to someone that is visiting for the first time... photos of people without the bicycles, are just photos of people. Besides I have often enjoyed the glimpse of the personality of the person on the bike, that the the bicycle often reflects. But, keep up the great work Mikael. I'll be back to look at more photos regardless. I loved this idea in your presentation. Literally, something presented that has probably never been done before. With the helmet thing not enough is said about the type of bike. On the "Granny" bike you are in balance like walking it just feels safer and you only go as fast as a three and a half hour marathon runner. Nobody suggests "jogging helmets"
I find in a city in Europe which is as car dependent as nearly any in the USA and poor cycling infrastructure that when you give clear signals most drivers really help you out. I like this! More please! I see your point about cropping out the bicycles to analyze the human aspect. These are great pictures and I hope at some point you share them again with the bicycles! What a novel idea, a before w/o bicycle and after reunited with cycle. A human apart as it were. It just excites me with expectations. See what your started.